0939 - 1101 - G-BXRO - C206 - parachuting from Movenis. 1011 - 1020 - G-UFCI - C172 - Ards to Oban (EGEO). 1049 - 1206 - G-BMOF - C206 - parachuting from Movenis. 1152 - 1200 - G-FGXP - B407 - ops Downpatrick. 1426 - 1514 - Downpatrick to west of Mournes. 1322 - 1342 - HLE23A - G-NIHM - EC35 - departed Maze to west. 1437 - 1500 - HLE23E - routing west of Lough Neagh to Maze. 1333 - 1442 - G-XZXZ - R44. 1350 - 1421 - G-JOYT - P28A. 1414 - G-HWKS - R44 - Ards to private HLS Dungannon. 1511 - 1533 - HLS Dungannon to Ards. 1424 - G-UFCO - C152 - Groomsport - Whitehead - Ballymena - north coast. 1605 - returning to Ards. 1541 - 1547 - G-SUCT - R22. 1856 - 1945 - N777UK - B772 - heading 309 at FL340 climbing FL400 from Stansted to La Guardia (KLGA). 0610 - 0637 - CG199 - G-MCGT - A189 - from/to Prestwick but operating along the River Lagan as far as Stranmillis. 0735 - 0811 - PYN04 - G-FLYK - BE20 - along the Down coast at FL220 from Haverfordwest to Edinburgh. 1106 - 1154 - F-RAFA - F900 - heading 311 at FL380 along the east Antrim coast out of Villacoublay (LFPV). 1139 - PYN01 - G-FLYW - BE20 along the Down coast at FL220 out of Haverfordwest. 1242 - 1300 - HLE23A - G-NIHM - EC35 - Maze to Ballymena. 1421 - 1439 - HLE23E - Ballymena to Maze. 1308 - 1331 - N65MJ - BE55 - over Enniskillen routing Weston to Carrickfinn. 1631 - 1652 - Carrickfinn to Weston. 1502 - 1508 - G-ENSX - R44. 0311 - 0357 - DAL132 - N508DN - A359 - heading 101 at FL410 - from Detroit (KDTW) to Amsterdam. 0904 - 0934 - FNY5481 - 1 - E-2C Hawkeye - 4f - to Prestwick. (Not an overflight but one of note). 1154 - FNY5481 - Prestwick to Keflavik. 0919 - TSC091 - C-GYQV - B738 - heading 124 at FL410 - from Toronto (CYYZ) to Paris (LFPG) returning after Winter lease, (ex F-GZTS). 1739 - HLE23A - G-NIHM - EC35 - lifted Maze routing to Enniskillen via Lurgan. 1800 - HLE23E - returned from Clougher - stood down. 1823 - 1909 - SWG9974 - C-GSWL - B738 (G-TAWL) - heading 120 at FL410 from Toronto to St Athan on return from Winter lease. United Airlines 777 N2333U went over Newcastle at 3:30am or so... 32,000ft and the noise out of it was quite unreal for the height. 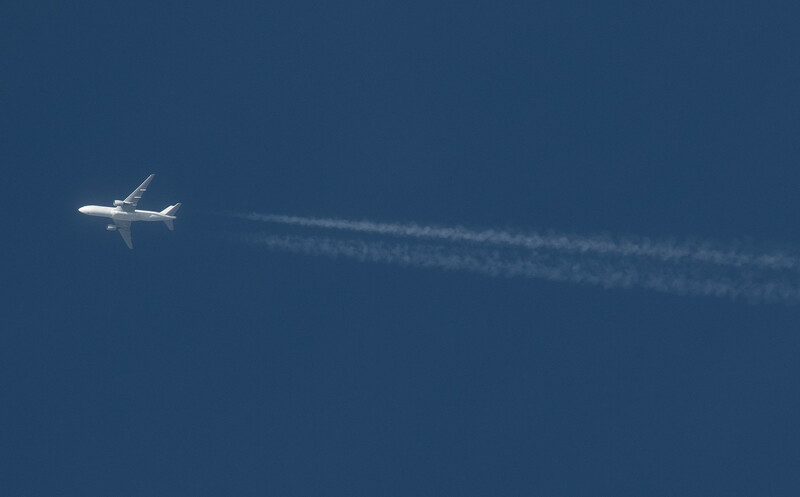 0916 - 1002 - DAL133 - N507DN - A359 - heading 283 at FL380 from Amsterdam to Detroit (KDTW). 0923 - 1012 - PYN01 - G-FLYW - BE20 - along the Down coast from Edinburgh to Haverfordwest. 0845 - 0854 - HLE23A - G-NIHM - EC35 - lifted from Maze. 0952 - 1002 - HLE23E - returned to Maze. 1114 - 1118 - HLE23A - lifted from Maze heading SW.
1455 - 1517 - EZS35JM - HB-JXJ - A320-214/S - c/n 7772 ex G-EZRK heading 331 at FL360 from Geneva to Keflavik. 1542 - 1618 - BLUE41 - 83-0081 - DC10 - coming around the north coast inbound Mildenhall with RETRO91 Flt (91&92 - F15's 86-0171 and 01-2001) in tow for Lakenheath. 1605 - 1619 - EZY16TN - G-EZGR - A319-111 c/n 4837 ex HB-JYB from Ronaldsway to Gatwick. Back on the UK register 03/04/2018. 1620 - N330MG - AS50 - Ballycastle to Glengormley. 1938 - 2026 - EZS83QT - HB-JXJ - A320 - heading 114 at FL340 from Keflavik to Geneva. 0915 - 1004 - DAL133 - N501DN - A359 - heading 293 at FL400 from Amsterdam to Detroit (KDTW). 0834 - 0850 - G-CIUY - B06. 0907 - 0924 - G-JOYT - P28A. 0930 - 0946 - G-HMED - P28A. 1114 - 1132 - HLE23A - G-NIHM - EC35. 1405 - 1445 - HLE23A - to scene Greyabbey. 1529 - 1538 - HLE23E - return to Maze. 1814 - HLE23A - lifted from Maze. 2048 - HLE23E - finals to Maze. 1148 - 1224 - G-MILR - AP22 - routing along North coast to Malin Head. 1221 - 1310 - BLUE41 - 83-0081 - DC10 - heading 290 at FL340 to round the Antrim coast by Rathlin Island. 1224 - 1323 - RRR9401 - ZZ332 - A332 - heading 326 at FL280 out of Brize Norton routing along the Antrim coast. Orbiting to the north so presume waiting on some chicklets. 1308 - 1332 - CFC0611 - 140103 - P3 - inbound Prestwick from the Atlantic. 1425 - 1513 - RRR2702 - ZZ334 - A332 - heading 344 at FL250 - 360 out of Brize Norton heading along the Antrim coast. 1540 - 1600 - PDG66 - G-NLSE - AS55 - to Ards. 1746 - N330MG - AS50 - Bellaghy to Mossley. 1753 - G-CNAB - Jabiru UL - Whitehead - Groomsport - Ards. 1601 - G-DMCI - C42 - Carrickmore to Ards. 1814 - Ards to Carrickmore. 0753 - 0826 - N842AT - B737-436SF c/n 25842 - West Atlantic Cargo Airlines ex G-DOCL on delivery flight from Goose Bay (CYYR) to East Midlands - to be come G-NPTZ. 0919 - 1136 - PDG66 - G-NLSE - AS55 - Ards -. 1239 - 1339 - Templepatrick area. 1111 - 1138 - CFC0611 - 140103 - P3 - departed from Prestwick for the Atlantic. 1244 - N330MG - AS50 - Kilrea - Toomebridge (land) - Templepatrick (land). 1320 - Templepatrick to Tardree. 1425 - lifted Tardree for Bellaghy. 1751 - private HLS to Tardree. 1829 - Tardree - private HLS. 1854 - private HLS to Bellaghy. 1300 - HLE23E - stood down and returning to Maze. Not the first time it seems to have had trouble. Parachuting up at Movenis using G-BXRO,Cessna U206G. 0906 - 1032 - G-BXRO - C206 - parachuting Movenis. 0959 - 1031 - PYN04 - G-FLYK - BE20 - over Co Down heading 034 at FL200 from Haverfordwest to Edinburgh. 1001 - 1010 - G-SUCT - R22. 1106 - 1124 - HLE23A - G-NIHM - EC35 - Maze to scene out to NW. 1222 - 1227 - from scene to Altnagelvin Hospital. 1355 - 1422 - HLE23E - Eglinton to Maze with an ILS approach runway 17 Aldergrove. 1121 - 1129 - G-XZXZ - R44. 1226 - 1301 - EI-DMG - C441 - heading 062 at FL270 over Co Down out of Waterford for Vanersborg (ESGT). Last noted over the North Sea east of Scotland. 1437 - 1537 - EZS35JM - HB-JXB - A320 - heading 313 at FL340 to track along the Antrim coast routing from Geneva to Keflavik. 1928 - 2037 - EZS83QT - heading 105 at FL370 from Keflavik to Geneva. 1513 - N330MG - AS50.